Let me introduce you to a little magic called brown butter. If you thought butter makes everything better, wait until you try the nutty, caramel-scented version of butter. It takes just a few minutes to make, requires no fancy ingredients, and adds phenomenal flavor wherever it’s drizzled. 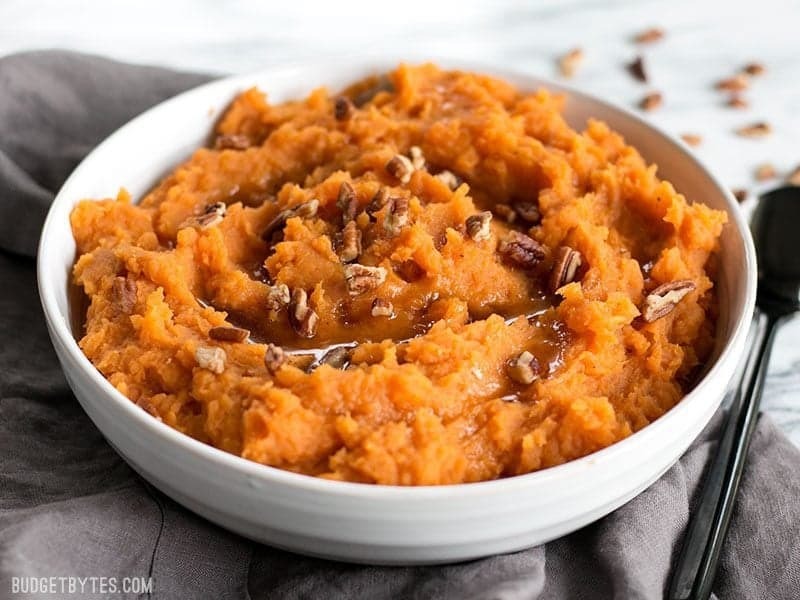 So, if you want to take your mashed sweet potatoes up a notch this Thanksgiving without having to buy even more specialty ingredients, these simple Maple Brown Butter Mashed Sweet Potatoes are the answer. ‘Cuz I know y’all are busy and can’t make another trip to the store for last-minute ingredients before the big day! Chances are you have everything you need for this already. I paired the brown butter in this recipe with a little bit of real maple syrup because its flavor is unique and undeniably fall-like. The deep flavor of the maple syrups matches perfectly with the nutty brown butter. Real maple syrup is expensive though, and if you can’t spring for it this time around you can use a little brown sugar in its place (their sweetness levels are not equal, so add the brown sugar to your liking). The good news is that if you do spring for the real thing you can just pop the rest in the fridge and it’ll be there in the future, as good as new, to make your next recipe sparkle. 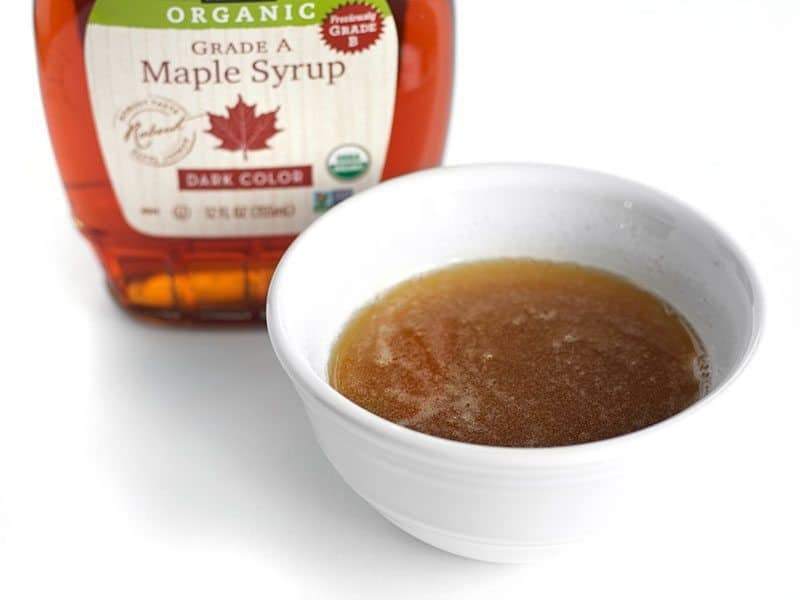 Check out my Maple Syrup recipe archives for more ways to use this incredible ingredient. 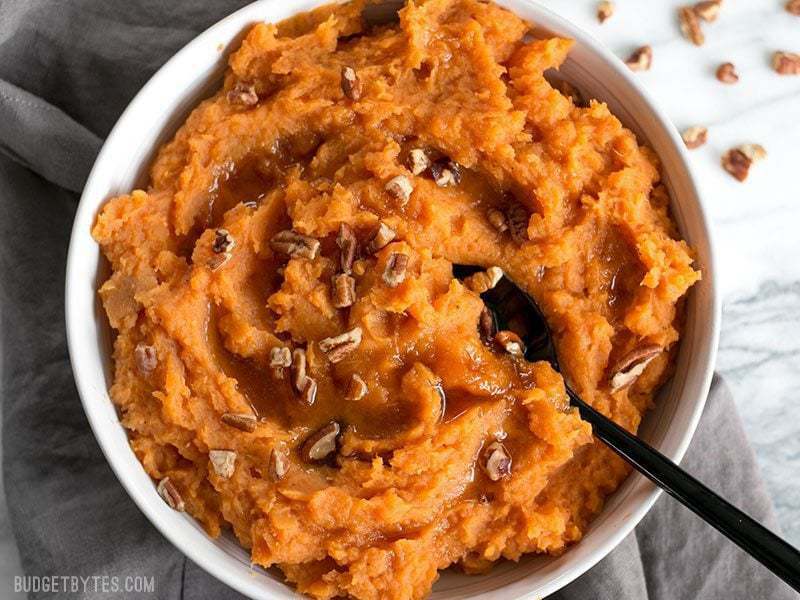 Maple Brown Butter Mashed Sweet Potatoes are a simple way to add a little something extra special to your Thanksgiving table. Peel and dice the sweet potatoes. Add them to a large pot and cover with water. Place a lid on the pot and bring the water up to a boil over high heat. Boil the potatoes until they are very tender when pierced with a fork (5-10 minutes depending on the size of your sweet potato cubes). 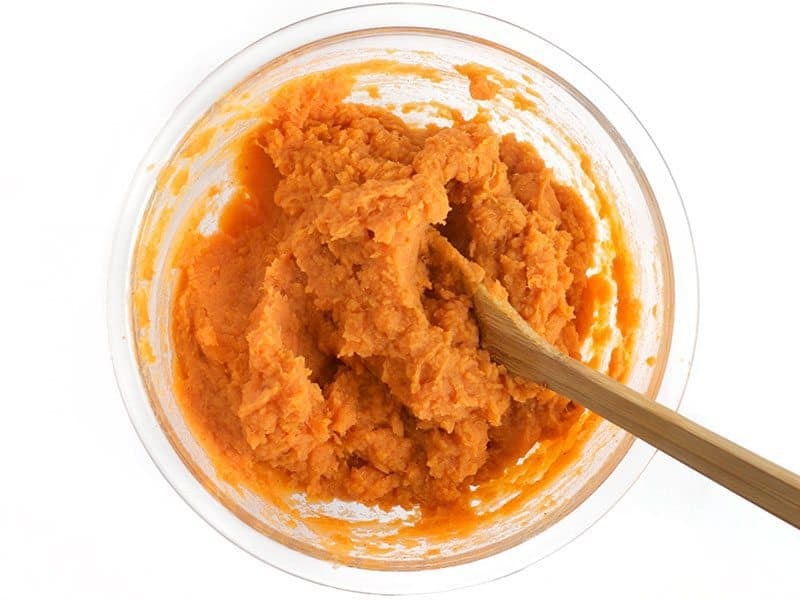 Drain the sweet potatoes and then mash until mostly smooth. 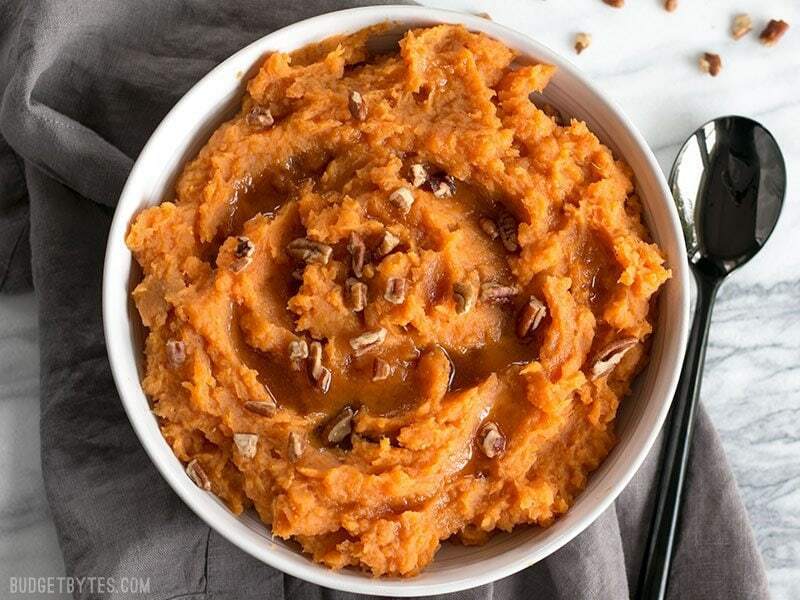 Set the mashed sweet potatoes aside. Cut the butter into equal-sized pieces. Place the butter in a light colored skillet or pot. Place the skillet over medium-low heat and let it melt and being to foam. 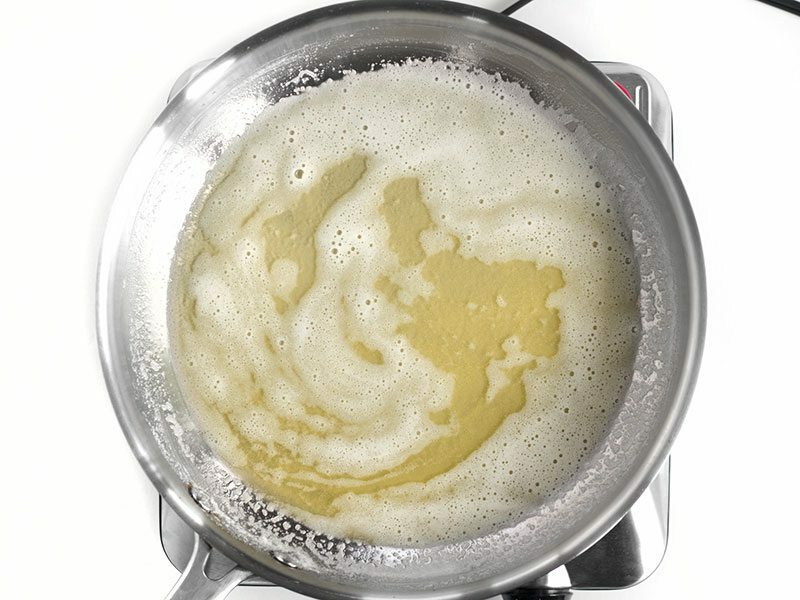 Continue to cook the butter, stirring constantly, until the butter solids begin to brown. Watch the butter closely once it begins to change color and remove it from the heat when it reaches a deep brown color and smells nutty or caramel-like. Immediately pour the butter into a separate bowl to stop the cooking process. Stir the maple syrup into the butter. 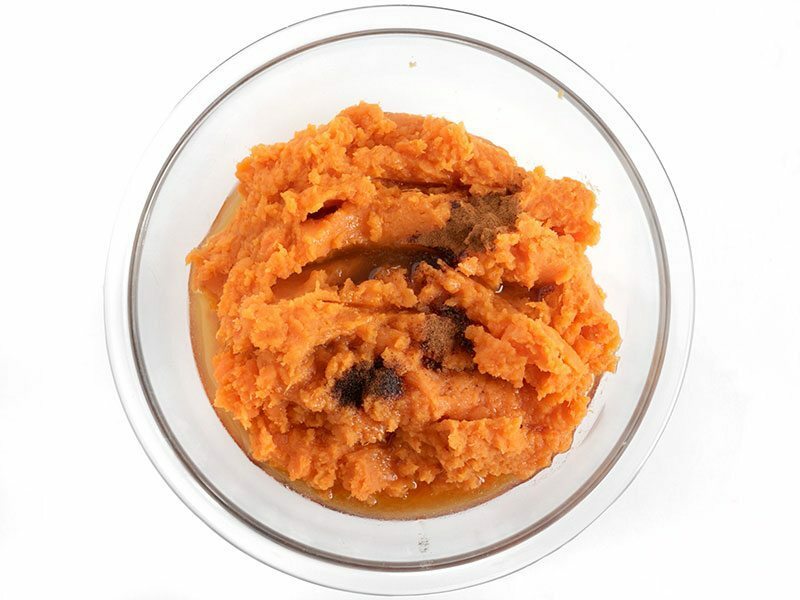 Pour the maple syrup and butter mixture into the mashed sweet potatoes. Reserve 1-2 Tbsp of the maple brown butter to drizzle over top as a garnish. Also add the cinnamon, nutmeg, and cloves to the mashed potatoes, then stir to combine. 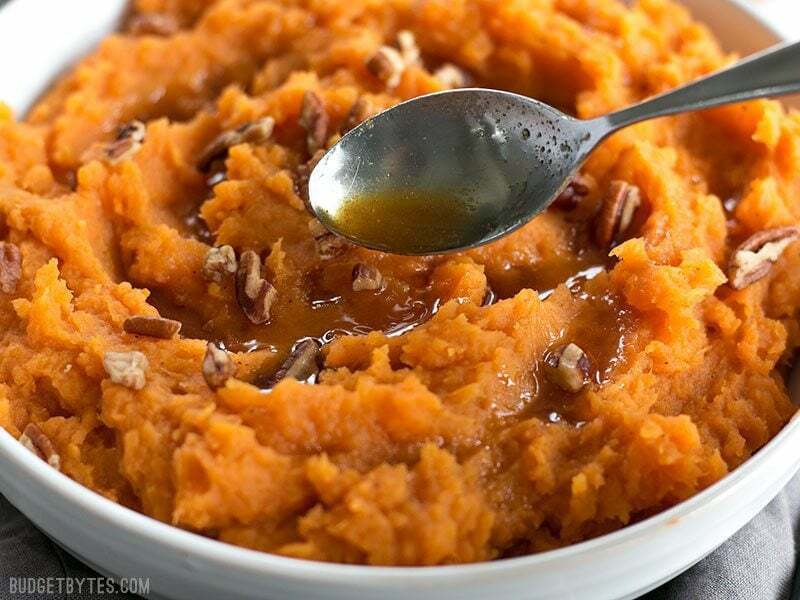 Taste the sweet potatoes and adjust the syrup, spices, or salt if needed. Sprinkle the chopped pecans over top and drizzle the remaining maple brown butter just before serving. *You can use salted or unsalted butter. If using unsalted butter, you may want to add a pinch of salt to the mashed potatoes to help the flavors pop. Peel and cut 3 large sweet potatoes (about 3 lbs.) into one-inch cubes. 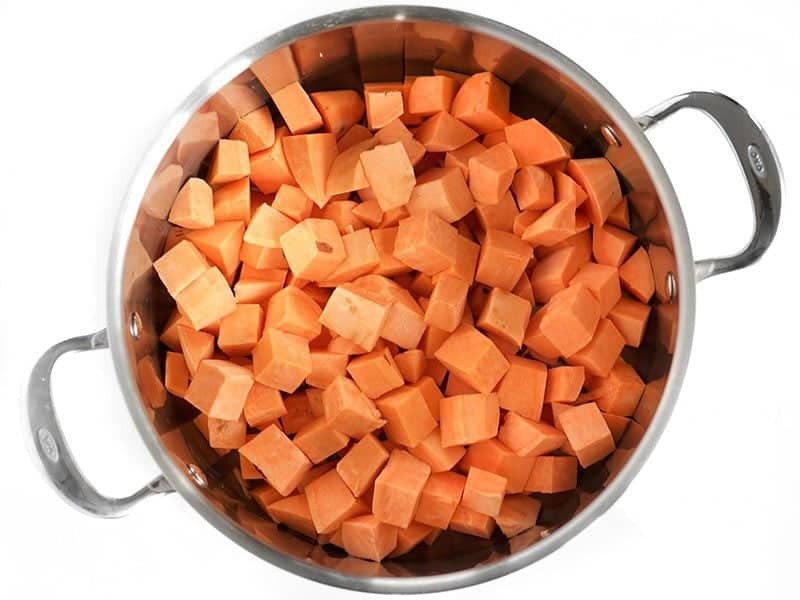 Place the cubes in a large pot and add enough water to just cover the potatoes. Place a lid on the pot and turn the heat on to high. Bring the pot to a boil and continue to boil until the potatoes are very tender when pierced with a fork. They cook fairly quickly but the total time will depend on how large your cubes are. 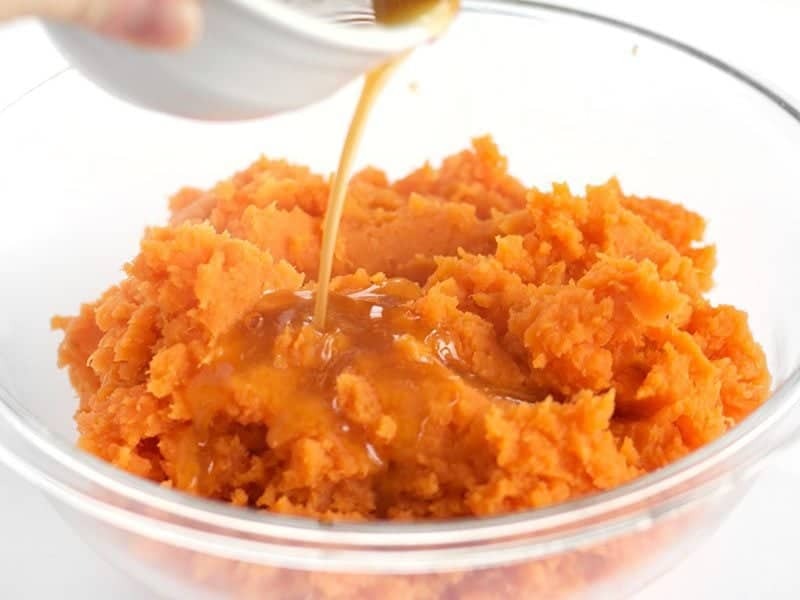 Drain the sweet potatoes and mash until they are fairly smooth. Set the sweet potatoes aside. 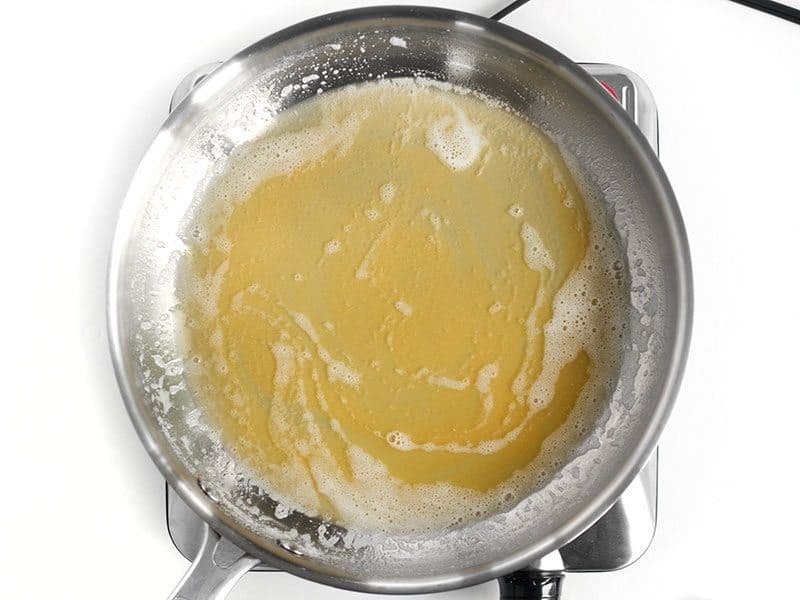 Cut 6 Tbsp butter into equal-sized pieces and place them in a light-colored skillet or pot (if you use a dark skillet like cast iron or teflon you will not be able to see the color change in the butter). Place the skillet over medium-low heat and let the butter begin to melt. As the butter cooks it will become foamy and the solids will sink to the bottom. 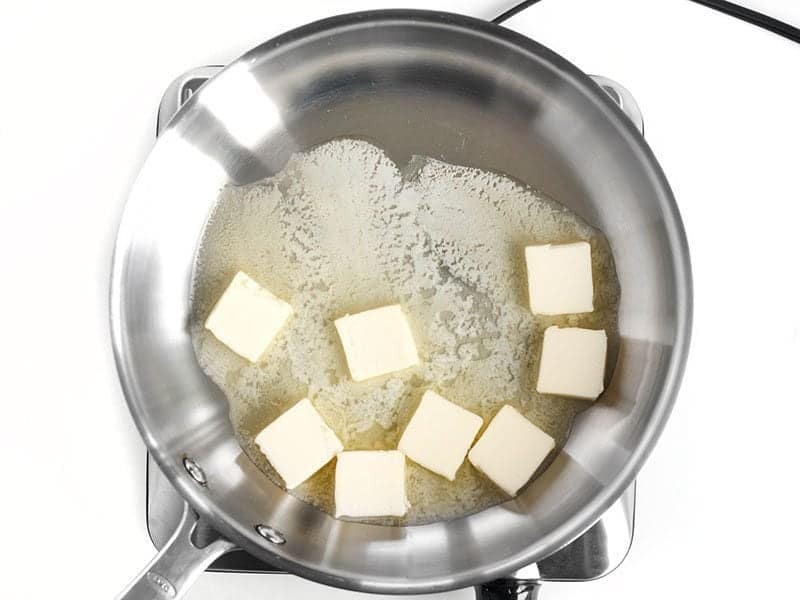 Stir the butter constantly as it cooks so the butter solids cook evenly. And then you’ll see the color begin to change rapidly. When it reaches a deep golden brown color stop. 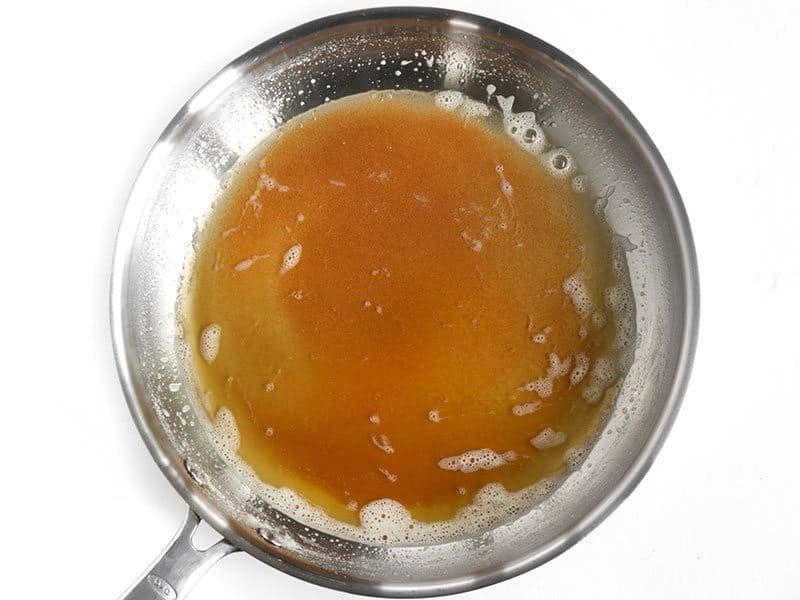 Remove the skillet from the heat and pour the butter into a separate bowl to prevent residual heat from continuing to brown the butter past the magic point. The butter should smell wonderfully nutty and almost caramel-like. Stir 1/4 cup real maple syrup (not pancake syrup) into your brown butter. If you can’t afford real maple syrup, you can go with brown sugar. Start with 2 Tbsp. and add more later if you see fit. Now, pour most of the maple brown butter into the mashed sweet potatoes. I like to save a tablespoon or two to drizzle on top before serving. Also add 1/4 tsp cinnamon, 1/8 tsp nutmeg, and 1/8 tsp ground cloves. Mix everything up well and then give it a taste. You may want to add a pinch of salt, or adjust the sweetness to your liking. I kept the spices subtle so the flavor of the maple and brown butter would take center stage. 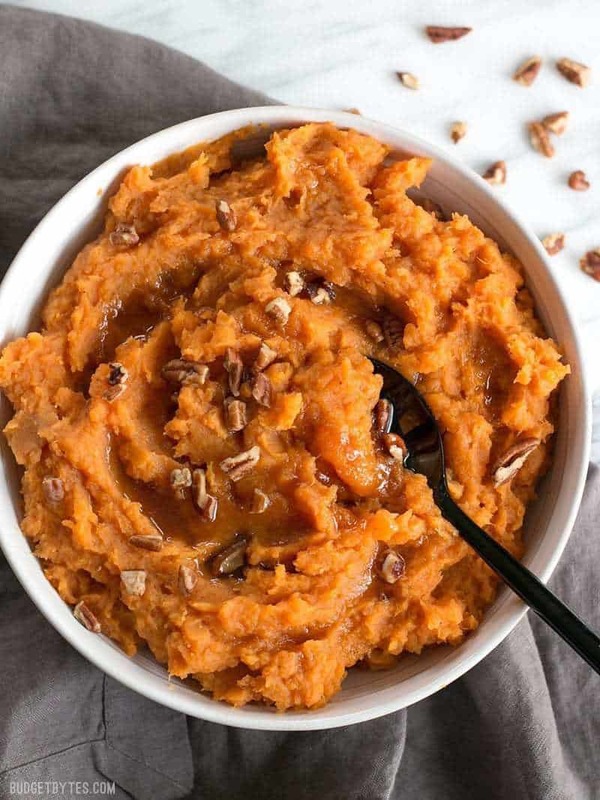 Transfer the Maple Brown Butter Mashed Sweet Potatoes to a serving dish, drizzle with the remaining maple brown butter, then sprinkle some chopped pecans over top. Totally simple, but totally elegant. You got this. I actually really appreciate the added pictures because I ALWAYS burn butter! The visuals of the butter at each step helped me know EXACTLY what stage is what so I didn’t burn it for once! Thanks and that crabby lady who said too many pics can jump off of a cliff. It’s not like she’s the genius who came up with this delicious recipe OR the awesome chef who took the time to put all these pictures in to guide people like me. Scroll on then, grumpy lady! Recipe looks delicious! Can this be made ahead and frozen? This recipe was delicious. Best sweet potatoes I’ve ever had. Great recipe! Thank you for sharing your recipe and taking the time to be so thorough. My family loved it! Amazing work per usual, Beth. Some people are just so ungrateful. Keep up the excellent work. I got one love the additional information and all pictures provided. As one with a Master if Science degree in Restaurant and Hotel Management knows the importance of consistency with recipes. These details provide this spot on! Also, as an added bonus, the costing details are perfect! By the way, the recipe is great too! Keep up the great work! I look forward to more recipes from you. a simple recipe does not need all this printing or info and pictures step by step. If you did this with every recipe your cook book would be bigger the encyclopedia of the world. Ann, there is a print button just below the thumbnail on the recipe card that will open up a one page recipe-only printable version. 23 pages for a simple recipe????????? ?